I do enjoy reading anthologies.I've read and enjoyed many stories from all the Authors. I'm looking forward to reading it. My go to holiday cookies are usually the abuse the cookie I make every year. We just enjoy sugar cookies that everyone can decorate. I've been looking forward to reading this book. So many terrific authors all in one! I love sugar cookies, Connie. I have young friends who come over to make and decorate sugar cookies with me over the holidays. So much fun! I don't usually read them, but with these authors I would. We have a family recipe for a light, almond/grape jelly filled thumbprint cookie - nuts optional. I quite like anthologies and I've read books by all of the listed Authors. I don't make Christmas cookies as nobody eat them. I generally prefer full length novels, but as the holiday season gets into full swing, I find anthologies to fulfill my need for getting swept up and away. I have read and really enjoy Tessa Dare and Sarah MacLean. 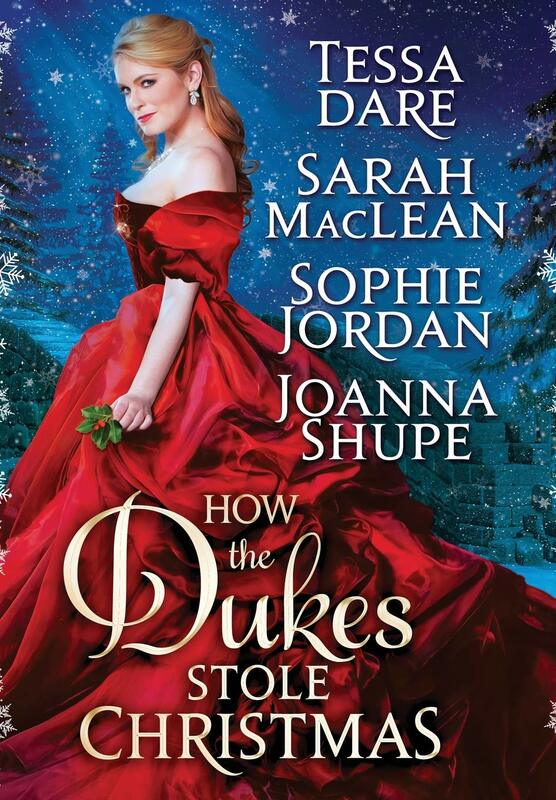 Sophie Jordan and Joanna Shupe are in my TBR pile and have been residing there for a time. Our go-to family cookies are spice cookies and one made of Marzipan mixed with eggwhite, decorated with a quarter of a glaceed cherie and baked til golden but still chewy. Have no idea what the latter are properly called. During the holidays I tend to read anthologies more. Yes I have read books by Sarah MacLean and Joanna Schupe. Go to cookie for Christmas are Crescent cookies. I love Christmas anthologies. I am fortunate enough to have several of the old Signet paperbacks and I reread on a regular basis.....it is a wonderful way to cheer me up. I love those Christmas anthologies. Our go-to Christmas cookie is the Mexican wedding cookie. I do enjoy Christmas anthologies but I'm not quite at the point to pull them out to read. I enjoy some anthologies. I've only read Tessa Dare of this group. And butter cookies are the favorite here. I have read all of these authors and I enjoy anthologies. I love anthologies. They are perfect for a quick read when you have to wait for an appointment or for someone. They are a great way to try out new authors too. I have read and enjoyed stories from all 4 of these authors. My M-I-L's spritz cookies are our traditional holiday cookie recipe. I love anthologies--especially Christmas ones--I feel like Christmas lends itself to anthologies, where you want something fun, sweet, and maybe a little bad for you. *LOL* And I love all these authors, so what is not to love? This looks like one for my Keeper Shelf. I enjoy anthologies and those for the holidays are favorites. I love checking the recipes and finding new ones my family will enjoy. All the authors in this collection are favorites. I make a sour cream crescent cookie for the holidays. The are light and delicate. We love them.